Among the most beautiful châteaux in the Loire Valley, the Château de Chenonceau is easy to reach by train...and therefore also perhaps the most frequently visited (read: crowded). 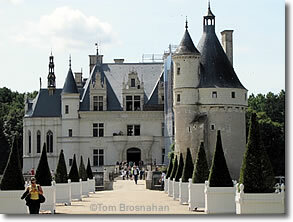 You're here to visit the Château de Chenonceau, one of the most dramatic, beautiful and popular castles in France. Among the reasons for the château's popularity is its accessibility: it can be reached easily by train, making it a prime candidate for those wishing to visit a château on a day excursion from Paris (map). The town of Chenonceaux has its own SNCF train station right at the entrance to the tree-shaded lane leading to the château. The small town—which, you may have noticed, ends its name with an 'x' although the château does not—is just on the other side of the train tracks from the château, with its cafés, restaurants, hotels and other services.